eeeeeeep I decided to take part in a challenge this week... a filofax one to be exact! you may have realised I'm a bit of a stationary geek so the opportunity to mix it with fashion was too fun for me to resist! the challenge was to pick a fashion decade to style with my filofax.. I couldn't resist a chance to wear my nerdy new dungarees so I opted for a bit of 90's grunge..
if you have a minute and would like to vote you can pop over to their facebook gallery here and simply 'like' my pictures! thanks to those who've voted already! 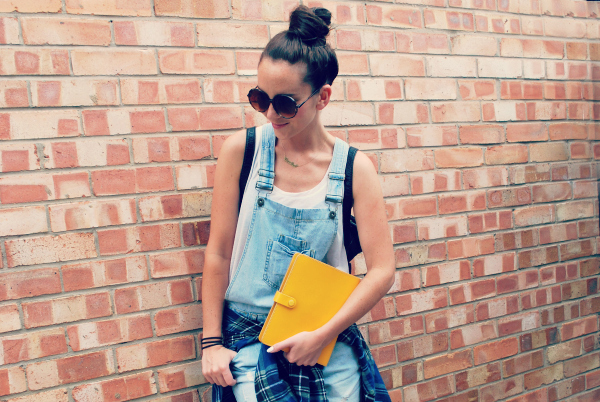 This outfits so nice I really want dungarees now! Really hoping you get to hold the giveaway! Those filofaxes are amazing! I've always been a stationary geek at heart! I think you pulled off the 90's fantastic! woah trigger happy with the exclamation marks there...I was clearly very excited. I really lvoe this outfit. Only you can make it look this good! Ah those blazers are such a beautiful colour. I'm dying to get my hands on a pair. Good luck with the competition! love the outfit, liked it on fb! I looooove long-leg denim overalls! This is so cute, it looks like you're in some sort of John Hughes highschool movie! I absolutely adore this outfit! Just stumbled upon your blog and I am in love.